The average consumer might not give it that much thought, but many things we use on a daily basis required precise tool and die cutting at one point or another. From transportation to construction, tool making and die cutting have their importance in building today’s world as we know it – literally! Here at Protocast Inc., we’re proud to work in the machining industry, serving Colorado as the preferred Denver machine shop that countless businesses can rely on time and time again. As it pertains to our work, our sand casting and rapid prototype casting professionals are going to cover some interesting and even somewhat surprising statistics about the tool and die industry here in the United States. As always, if you have any questions about aluminum investment casting, various alloys that we work with, or you’re curious about how we can help your company, feel free to get in touch with us. According to datausa.io, the most common industries that employ tool and die makers are metalworking and machine manufacturing, motor vehicles and motor vehicle manufacturing, and machine shops. Specifically, machine shop employees specialize in screw, nut and bolt manufacturing. The nuts and bolts of this data were based on the number of employees in each industry. We found the number of tool and die workers who hold degrees in Visual and Performing Arts to be a little higher than expected, so that was an interesting surprise. Ah, and now for the really fun data! Datausa.io obtained some interesting information from the Bureau of Labor Statistics, determining that tool and die makers generally need multiple skill sets to be successful in this industry. The most popular skill sets were Quality Control Analysis, Operation Monitoring, and Operation and Control. 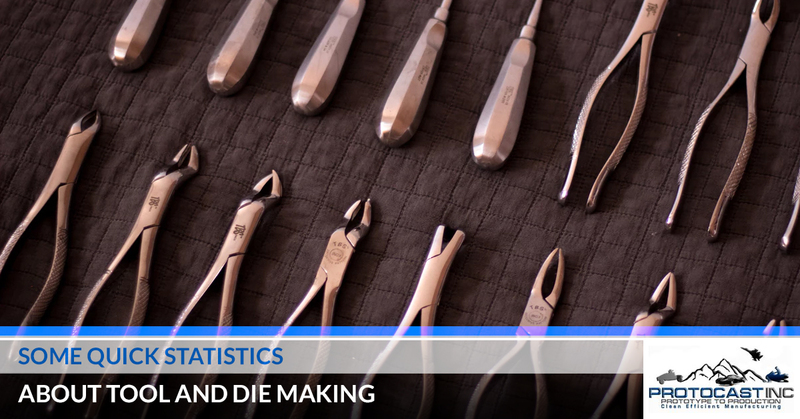 The same data also suggests that tool and die makers in this day and age are more likely to be successful and carry their career with supplementary skills like Technology Design, Repairing, and Equipment Selection. Critical Thinking and Time Management also ranked high as relevant skills, but of course, those are pertinent in any job! Excellence and Precision Are Our Standard at Protocast Inc.
By hiring only the most qualified tool and die workers – among other specialized engineers at our Denver foundry – Protocast Inc. is able to enjoy a reputation of consistency and quality services. So, if business is in need of rapid investment casting, aluminum casting, sand casting, or other rapid prototyping services, feel free to give us a call today.